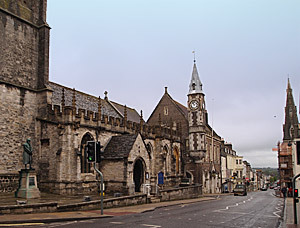 Dorchester is the county town of Dorset, located just north of the coastal town of Weymouth. The site has been occupied since prehistoric times, however, it was the Romans who founded the main town in AD 70, calling it Durnovaria. Dorchester was a Saxon mint in the 10th century, a hunting centre under the Normans, and a Roundhead stronghold during the Civil War. A series of fires in the 17th and 18th centuries destroyed most of its medieval buildings. St Peter's was the only church in Dorchester to survive the fires. It is mainly 15th century with a 13th-century doorway and a 14th-century Easter sepulcher. In the churchyard stands a statue to the poet William Barnes, who lived in Dorchester from 1847 to 1886. In the Middle Ages the town was renowned for bear-baiting and as late as 1767 "Hanging Fairs" (public executions) were held. These were often attended by crowds as large as those that watched the gladiators fight in Roman times. The Old Crown Court was the scene of a noted trial in 1834, that of the six Tolpuddle Martyrs who were sentenced to a seven years transportation after forming the 'Friendly Society of Agricultural Labourers' - the start of the trade-union movement in Britain. Thomas Hardy was born near Dorchester at High Bockhampton in 1840. The son of a stonemason, he initially became an architect but the success of his fourth published novel, 'Far From the Madding Crowd', enabled him to give up work and concentrate on his writing. His novels and poems depict the Wessex and Dorset countryside. Local towns are recognizable in his novels, although given different names: Dorchester became Casterbridge, Tolpuddle became Tolchurch, Lulworth became Lulstead, and Sherborne became Sherton Abbas. 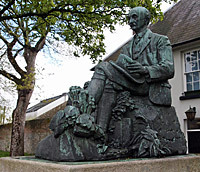 A life-size statue of Hardy stands in The Grove, Dorchester. Award-winning dinosaur and fossil museum with interactive displays and audio-visual presentations. Covers Dorset's history, from the Stone Age to the 20th century. Exhibits include; geology, natural history, archaeology and local history, including important finds from Maiden Castle. The museum's Thomas Hardy Memorial Collection includes some of the novelist's manuscripts and personal possessions. The museum also contains a section on local writer William Barnes and paintings by local artists. Dorset Military Museum, housed in the old Castle Keep, records the history of all the Dorset regiments from 1661. Exhibits include uniforms, medals and weapons, including the sword and saddle used by Cornet Glyn in the Heavy Brigade Charge at Balaclava. Located on the London road, carries a plate which warns that any person damaging the bridge was liable to be transported for life; an example of the severe justice existing in the 19th century. A 16th century thatched building close to the River Frome. Founded in 1610 by Sir Robert Napier. 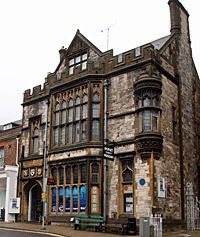 The building provided lodgings for "ten poor men", but now consists of shops and a cafe. Located in High West Street, it is a public memorial to the Tolpuddle Martyrs, who were pardoned in 1836 after prolonged local agitation. Located northwest of the town and date from the same period as Maiden Castle but are much smaller, covering about 20 acres. The site is surrounded by a single, low rampart. It was captured by the Romans who built a camp there. 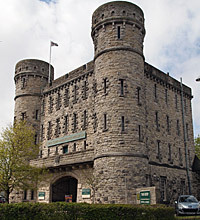 Located next to the County Hall at Colliton Park. Several mosaic floors still survive in the foundations, which have lasted nearly 2,000 years. Family friendly museum displaying antique toy bears, many of which are over lOO years old.